Today once again it has been all the more obvious what the Orthodox knew – that the Unia was and, unfortunately, remains a special project of the Catholic Church aimed at undermining canonical Orthodoxy. Dear organizers and participants of the conference! On behalf of His Holiness Patriarch Kirill of Moscow and All Rus and myself personally I would like to cordially greet all of the participants of the 4th European Orthodox-Catholic Forum, this year dedicated to the very relevant topic of religion and cultural pluralism: the challenges to the Christian Churches in Europe. I would like to note with satisfaction that our meetings have become quite regular. The format of interaction decided upon in 2008 has proved to be of use since it allows us to react swiftly to events happening in the world. Previous sessions were devoted to such problems as the family, the Church and state, the economic crisis and poverty. In the modern-day world there is not only an intensive dialogue of cultures but also cultures penetrate one another. These dynamic processes enable, on the one hand, the formation of a single world commonality, while on the other they enable a new means of examining the unique nature of various cultures. The demographic situation is changing, and intensive migration continues afoot. The aim of building a tolerant society often leads to the opposite of that of the desired effect. The Christian identity of Europe is under threat. These problems make themselves felt ever more acutely in everyday life and demand a serious theoretical analysis. However, in the present situation we cannot limit ourselves merely to the discussion of theoretical issues. We have to interact on a practical level too. Unfortunately, our forum is being held against the background of the sad events in the Ukraine. People are dying during this political stand-off while gunfire can still be heard on the streets and squares. The people remain deeply divided not only according to their political choices but also on religious lines. Sadly, the Greek Catholics have played a very destructive role in allowing this situation to develop. The words of their leading archbishop, hierarchs and clergy and an extremely politicized position have brought about the polarization of society and a worsening of the conflict which has already led to numerous victims. Unlike the canonical Ukrainian Orthodox Church, which has been able during these difficult months to unite people of various political persuasions, including those who have found themselves on both sides of the barricades, the Uniates have ostentatiously associated themselves with only one of the belligerent forces. The aggressive words of the Uniates, actions directed at undermining the canonical Orthodox Church, active contacts with schismatics and the striving to divide a single multinational Russian Orthodox Church have caused great damage not only to the Ukraine and her citizens, but also to the Orthodox-Catholic dialogue. All of this has put us back a great distance, reminding us of the times when the Orthodox and Catholics viewed each other not as friends but as rivals. Today once again it has been all the more obvious what the Orthodox knew – that the Unia was and, unfortunately, remains a special project of the Catholic Church aimed at undermining canonical Orthodoxy. It was here, in the country of Byelorussia, that the notorious ‘the Union of Brest’ of 1596 was concluded and which brought untold suffering to the Orthodox population of these lands. 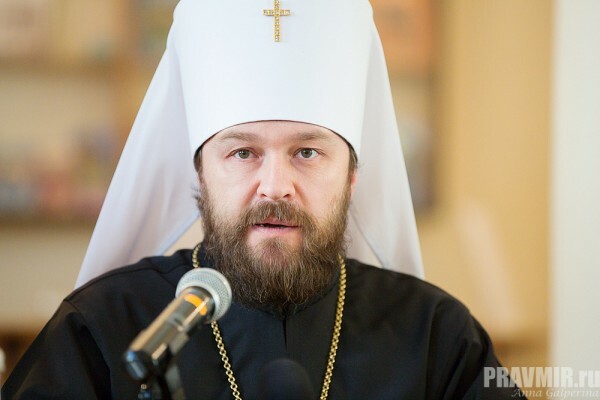 Allow me to use this platform to appeal to all our partners in the Orthodox-Catholic dialogue to do all that is possible to cool down the ‘hotheads’ among the Uniates, to halt the actions of the Greek Catholics in making the crisis in the Ukraine worse. Today one part of the Catholic Church is employing all her strength, talents and resources in strengthening Orthodox-Catholic interaction, while another (even though it enjoys autonomous status) is doing everything possible, as in former unfortunate times, to drive the wedge of distrust and enmity between Orthodox and Catholics. Our Forum, attended by Orthodox and Catholic theologians, is an important arena for both studying those issues that are of common interest and for achieving greater mutual understanding between our Churches. And I would like very much that our labours bore not only a theoretical nature but also be applied on the practical level in enabling the pacifying of enmity and the strengthening of Orthodox-Catholic interaction before the new challenges that confront us. I wish you all success in your forthcoming labours.